The BlackBerry Curve is a hot piece of Canadian machinery, but the 8320 we have here in the States lacks the GPS that everyone and their mother seems to crave. You could opt for the 8800 series if you really want GPS, but it’s slightly bigger and doesn’t have a camera. What’s a geek to do? 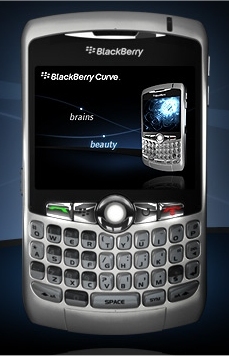 RIM announced today the 8310 Curve in Germany. How could you, RIM? How could you release a GPS-enabled Curve in Germany and not in the U.S.? At least we can take solace in the fact that the 8310 might show up on our shores sometime this year. This sudden onslaught of new RIM devices has me running in circles, but it’s saving me money because I know there’s something new coming out down the road. Ugh. For the German Vodafone subscribers in the audience, you can pick up an 8310 for 99 Euro now.